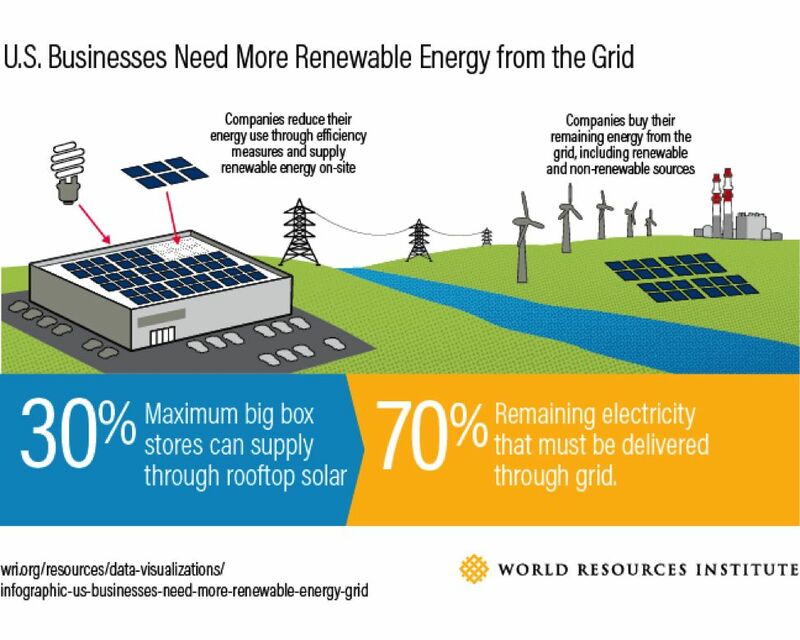 The World Resources Institute shows how utilities are turning corporate demand into renewables growth. Utilities are breaking away from traditional electricity products to offer customers access to large-scale renewable energy. 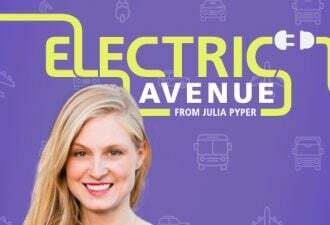 Until very recently, utilities did not differentiate the sort of power they offered customers. With very few exceptions, everyone shared in the cost and used electricity from the same fleet of power generating stations. But over the past four years, even regulated U.S. utilities have begun to offer new, large-scale renewable energy options to customers. World Resources Institute (WRI) data shows that across 10 U.S. states, utilities now offer 13 green tariffs -- programs that let customers purchase large-scale renewable energy over the grid. We take a closer look at the trends and motivations that have made utilities important players in the rapid scale-up of renewable energy to serve corporate buyers in the U.S.
Why are utilities stepping up? In markets where wind and solar power have become cost-competitive, utilities have more economic incentives to add renewable energy. 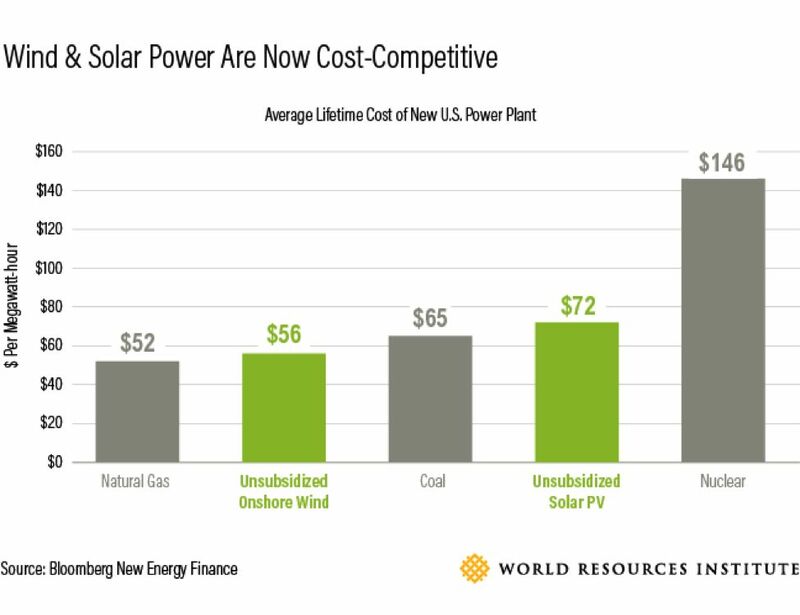 Renewable resources offer a great low price for the next 20 years -- without the risks of fossil-fuel price spikes. Utility leaders overwhelmingly anticipate substantial solar and wind power growth in the next 10 years, according to Utility Dive's 2017 survey of the sector. Among utility executives, 71 percent say utility-scale wind will increase moderately or significantly over the next 10 years, and 82 percent predict the same for utility-scale solar. MidAmerican Energy, a Berkshire Hathaway Energy subsidiary, has talked about its extensive investments in wind in the same way -- as an effective way to keep prices low for customers. 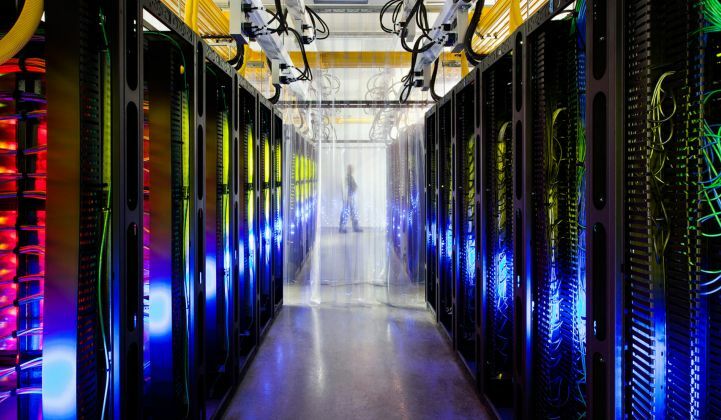 The company also used its wind investments to serve the renewable energy requirements of major data centers, such as Facebook and Google, in their service territory. How big is the demand for renewable energy on the grid? Through RE100, 90 companies have committed to 100 percent renewable power. Clean energy and greenhouse-gas reduction targets are now the norm for Fortune 500 and Fortune 100 companies. The World Wildlife Fund and Ceres’ Power Forward 3.0 report shows that almost half of the Fortune 500 and a majority of the Fortune 100 now have climate and energy targets. Companies with renewable energy commitments can only go so far with on-site solar and efficiency. To meet the most ambitious targets, like a 100 percent renewable energy goal, companies have to tap into the grid and are turning to their utility to provide solutions. Big businesses have communicated their needs to U.S. utilities. 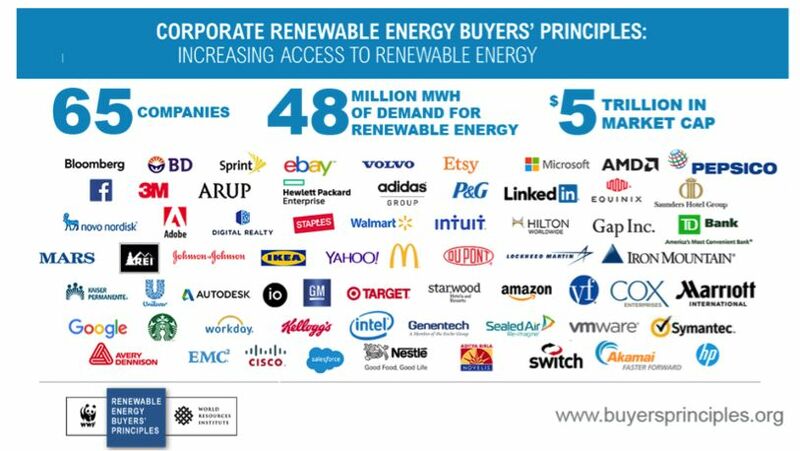 Sixty-five companies have signed on to the Renewable Energy Buyers’ Principles, which tell utilities and other suppliers what industry-leading, multinational companies are looking for when buying renewable energy from the grid. How are utilities stepping up? To meet customer demand for renewable energy, traditional utilities have now created 13 green tariff options across 10 states. 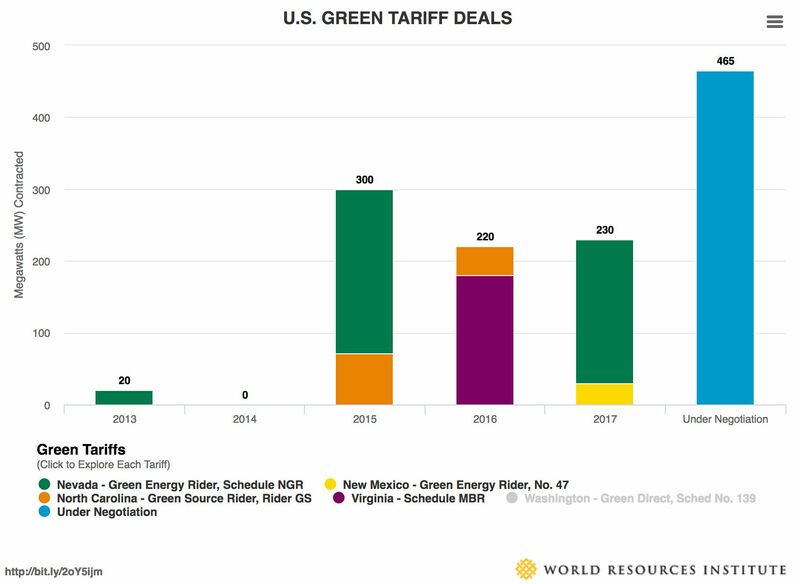 In the six months since the last update to WRI’s issue brief, "Emerging Green Tariffs in U.S. Regulated Electricity Markets," utilities have added three more green tariff options -- including the first offered by a public power company, Nebraska’s Omaha Public Power District (OPPD). What is the impact of green tariffs on the grid? Who is using these tariffs? To date, customers have contracted for approximately 900 megawatts of new renewable energy under five of the tariffs. This is approximately enough electricity to power 160,000 average American homes a year. This spring, utilities and customers are negotiating hundreds more megawatts of additional purchases. In April 2017 alone, major announcements from Puget Sound Energy and OPPD confirm that buyers are ready and willing to act in partnership with their utility. How can customers keep up with these new options? WRI's interactive U.S. Renewable Energy Map: A Guide for Corporate Buyers shows all of the green tariffs that utilities offer across the nation. The map also details one-on-one special contracts that customers have signed with utilities. These special contracts show a utility is willing to explore options, even if they haven’t gone as far as creating a new tariff. Today, green tariffs are a small part of the overall U.S. renewable energy market, reflecting their pilot status. But the programs create a runway for renewables at a time when demand is increasing, not just from businesses, but also cities, universities, hospitals and smaller companies. Innovative partnerships will continue to emerge between utilities and their customers as both grapple with the rapidly changing electricity sector. Green tariffs are only three years old, but with increasing demand, interest in renewables by utilities and the continued fall in renewable energy prices, green tariffs look like they’re here to stay. This post was republished with permission from the World Resources Institute.